The Eucharist is the crowning achievement of the well-known liturgical scholar, Alexander Schmemann. It reflects his entire life experience and thoughts on the Divine Liturgy, the Church's central act of self-realization. The Author:Father Alexander Schmemann (+ 1983) was a prolific writer, brilliant lecturer, and dedicated pastor. 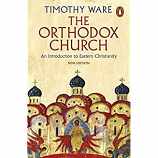 Former dean and professor of liturgical theology at St Vladimir's Orthodox Theological Seminary, his insight into contemporary culture and liturgical celebration left an indelible mark on the Christian community worldwide."